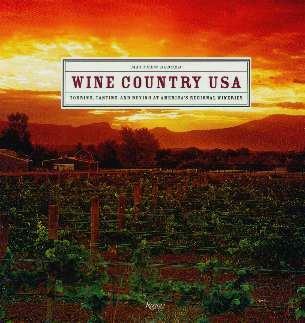 When one thinks of wine-producing areas in America, California is usually the first to come to mind. I live in southern Colorado and have yet to take seriously the signboard to a local winery. Wine expert Matthew DeBord has put together an exciting "exposé", if you like, on where else in the country they make wine - you'll be surprised. And, he's put together wine tours for those interested in sampling (and seeing the vineyards) which wines are being produced where. Upon looking at the contents of this book, I was surprised to see Long Island, the Finger Lakes, the Mid-Atlantic, the Southeast, the Midwest(! ), the Mountain States (maybe), but expected Oregon, Washington, and of course, California. Who knew wine came from the Midwest? However, his opening line, "If you're like most wine drinkers, you've probably never once in your life considered uncorking a port from Texas, a Chardonnay from Virginia, or a sparkling wine from Michigan", says it all. Texas and "port", to me, equals Corpus Christi or Galveston. Anyway, DeBord, a respected authority on wines beyond the west coast, helps to educate us on what's being grown and bottled out there. He gives us a wonderful peek into the industry and if you're one to collect wines, his advice is, "It's best to drink the wines you buy right away. The vast majority of American regional wines, and even most wines from California, Washington, and Oregon, are not meant to age." Each area has "At A Glance" vineyard details, addresses and websites, labels, wine tasting tour maps, accommodation recommendations, and interesting information written in easy-to-understand lingo. Who'd have thought there would be a wine region in New Jersey, or Michigan, or even Utah? I loved the pictures of the charming homes on the estates (e.g. look at page 192 and the oppulent house on page 199) and the book is full of wonderful illustrations. Check out the Biltmore Winery tasting room on page 83 - sublime. Conclusion - Lovely glossary and details - you can buy wine online if you can't get to the farms in person. A great addition to anyone's books on wine.